Chicago’s recent designation as the country’s “rat capital” can be attributed in large part to a particular type of home: rental units. A new study by researchers from Lincoln Park Zoo found that areas of the city with a high rate of renter-occupied units had more rats than neighborhoods where owners make up a larger portion of residents. What’s behind the trend? Although more analysis is needed, researchers said one potential reason is that renters and off-site building managers could be less concerned with taking steps to control rat populations as compared to owners, who have more of a stake in the long-term condition of their homes. Poll: How many times did you see a rat before filing a complaint? The study, published Wednesday in the journal Frontiers in Ecology and Evolution, notes that rats have been estimated to cause more than $27 billion in damage to consumer goods each year in the U.S. The rodents can also transmit harmful pathogens to humans. Public rat complaints in Chicago have increased by nearly 40 percent over the past decade, up to nearly 46,000 complaints last year alone, giving Chicago the most rat complaints per capita of any U.S. city, according to the study. 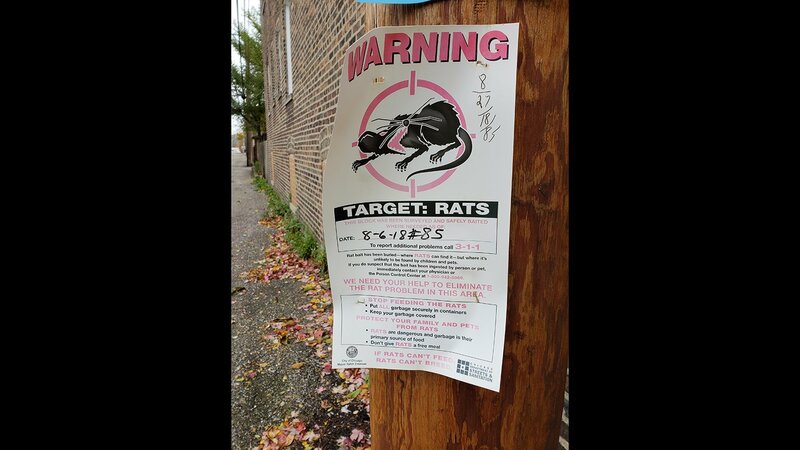 In examining the city’s rat problem, Murray teamed up with Arlington Heights-based Landmark Pest Management to determine whether areas with more rat complaints actually have more rats. The objective was based on an understanding that rat complaints might not accurately reflect the number of rats in a certain area, given that the likelihood of reporting complaints can be driven by factors such as income, location and trust in local government. Working with Landmark’s pest management staff, Murray’s team trapped brown rats in 13 community areas that were selected to represent a wide range of average income levels and development. In each area, rats were trapped in the two alleys with the highest number of complaints, as indicated by data from the city’s Department of Streets and Sanitation. After recording the number of rats trapped in each location, researchers compared their results to nearly 370,000 complaints made to the city’s Bureau of Rodent Control between 2008 and 2018. They found that despite the various factors influencing whether residents file complaints, areas with more complaints did in fact have more rats. The finding, researchers said, demonstrates that public rat complaints can be an effective tool for cities to use in targeting rat prevention efforts. Another finding shows – unsurprisingly – that alleys with more rat complaints and rats trapped also had larger amounts of uncontained garbage. This shows that city-wide rat control initiatives must consider strategies not just for rats but also for underlying issues of waste management, researchers said. Despite previous studies indicating that rat populations are often larger in areas of cities with high rates of vacant or abandoned buildings, researchers found fewer rats on vacant properties in Chicago. Researchers said the finding is in line with a growing appreciation for the ecological value of vacant lots in cities, a phenomenon that could be ripe for further study, they said. The Lincoln Park Zoo-Landmark study is ongoing, and researchers plan to explore questions related to stress levels in rats, disease prevalence and indicators of risks to public health. How many times did you see a rat before filing a complaint?